A woman left in such agony she wanted to chop her leg off with a chainsaw has finally been diagnosed with Lyme disease. Samantha Frost endured 18 months of agony after being bitten by a tick but was fobbed off by doctors with just antifungal cream. 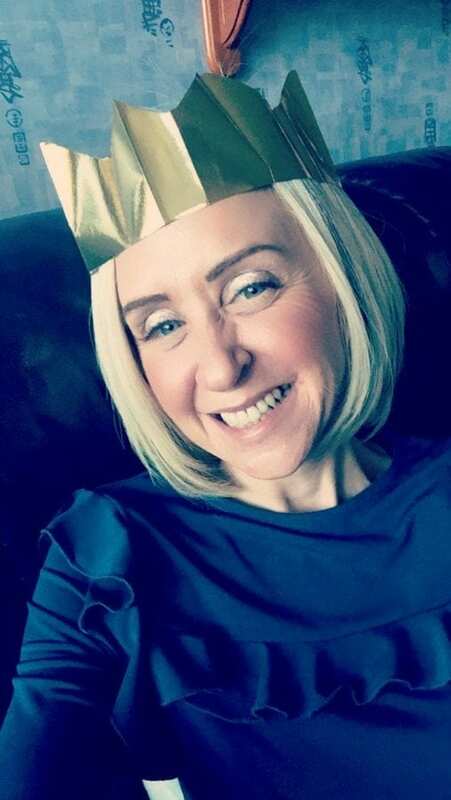 The 43-year-old tried to convince medics she had the virus after she found the parasite burrowed into her leg last February. She began to suffer terrible migraines but her GP dismissed the telltale rash on her leg last April and prescribed her with antifungal cream for ringworm. 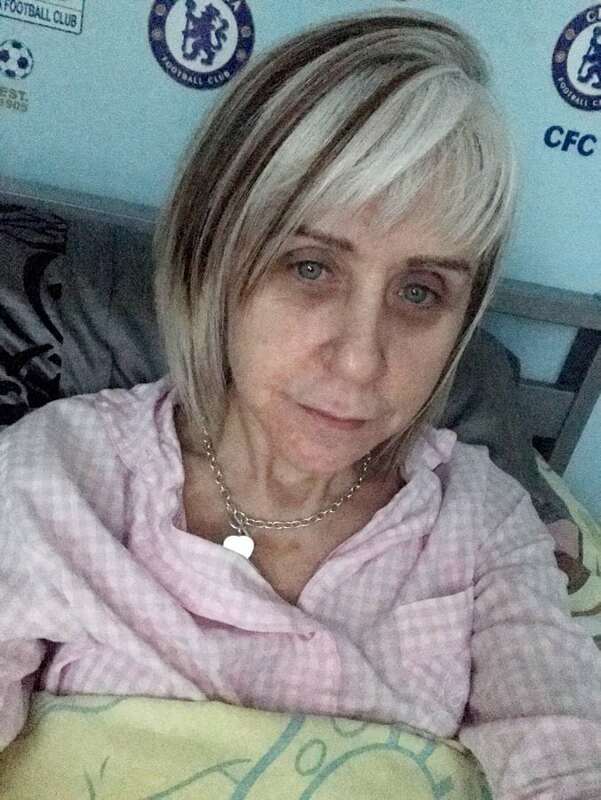 The mum-of-one described her illness as pure torture which has left her a shadow of her former self, housebound and unable to look after her 11-year-old son Toby who now lives with his grandparents. 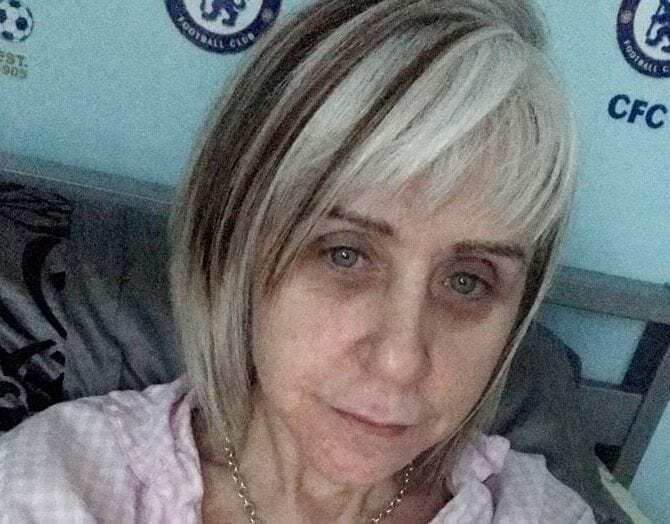 She was finally referred to the Infectious Diseases Clinic (IDC) at Northwick Park Hospital and after experts looked at photographs of the rashes taken last summer immediately concluded she had Lyme disease. Samantha, from Northolt in north west London, said: “When I came out of that clinic with the document with ‘Chronic Lyme’ written on it, I just couldn’t believe it. “I sat in the car and I cried because I had all the jigsaw pieces and I had just put the last piece in. “It was mixed emotions after so many knock backs. “I felt the happiness that my Lyme disease has finally been acknowledged but they were also tears of sadness to know I have got the disease and it could have been prevented. “If I’d had the antibiotics last April, I wouldn’t be ill now but it’s been so long now those tablets won’t really do anything. Samantha found the tick, which IDC consultants agreed caused the bacterial infection, two days after she was bitten at a paintball party in Surrey last February and when she ripped it out her skin, her leg poured with blood. After using an entire tube of antifungal cream prescribed by her doctor last April, Samantha returned to her GP the following month feeling no different but the doctor dismissed her concerns and gave her more cream. The former regional business manager began suffering extreme fevers, hallucinations and up to 200 involuntary body jerks per night and the rash on her leg disseminated into seven separate areas on her knee, calf and shin. Samantha crashed last August after losing her job, her friends and everything she used to love doing. She said: “I knew in myself I had Lyme disease because it isn’t normal, the way I felt and I still feel now. “It’s like I am inside the body of a 97-year-old – no matter how much I sleep, I am still tired. “The pain feels like somebody is stabbing you with a knife and like your legs are being electrocuted, burning from the inside but when you touch them they are cold. 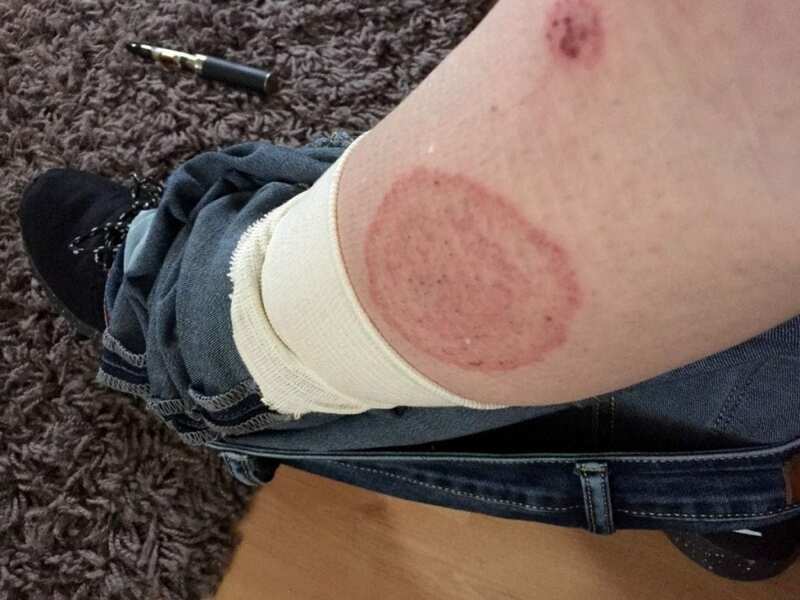 Samantha was rushed to Hillingdon Hospital where doctors confirmed her leg was covered in erythema migrans (EM), a bull’s eye rash indicative of Lyme disease. But despite being diagnosed with the telltale signs and referred for testing, medics still refused to provide her with antibiotics but referred her to a respiratory clinic and a neurologist suspecting ME. Samantha said: ” I was such a mess. I was on a drip after four weeks of constantly sweating. “I was so ill, I thought I was going to die in there. Three weeks after being discharged from the hospital, Samantha’s test results came back negative and she pleaded for antibiotics from her GP who also insisted she had ME. The doctor agreed to provide her with treatment for Lyme disease if she ‘dropped the issue,’ and prescribed her 100mg of Doxycycline per day for one month – half the recommended dosage – eight months after her bite. 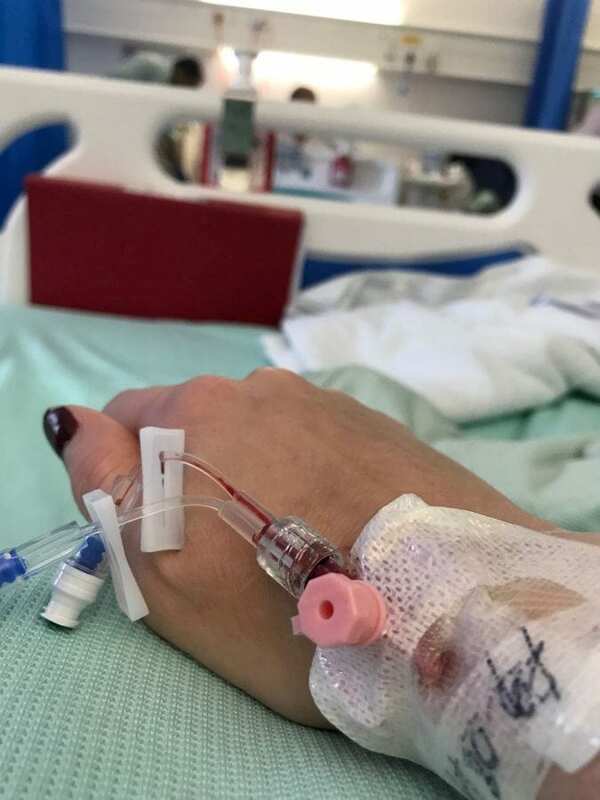 Samantha began crowdfunding for treatment in Germany after a DNA test from the USA confirmed she was Lyme disease positive with three co-infections including Babesia, Bartonella and tick-borne relapsing fever. After her brain scan in January, neurologists said she would benefit from an opinion from the Infectious Disease Clinic where she was finally diagnosed with Chronic Lyme and prescribed antibiotics on Monday. Samantha said: “My case was such a clear black and white case and the experts just joined all the dots up. Public Health England guidelines for patients with Lyme disease symptoms recommend doctors conduct a repeat test after a negative result but Samantha was offered no second examination. The mum-of-one hopes to have her little boy living back at home and wants to raise awareness of Lyme disease and the lack of knowledge she witnessed among doctors who dismissed her symptoms. She added: “I want to be well enough to have Toby back full time with me, he is my world. “I feel upset because I could be well now and earlier treatment would have stopped the damage it has done. Lyme Disease UK revealed last year only three per cent of GPs had completed a free continuing professional development module on the disease offered by the Royal College of General Practitioners. Experts predict there will be up to 45,000 new cases of Lyme disease in Britain each year and cases are thought to be increasing by 65 per cent each year worldwide.